Allium approximatum Gren. & Gord. Allium bosniacum Kumm. & Sendtn. Allium eminens Gren. ex Parl. Allium sphaerocephalon var. bosniacum (Kumm. & Sendtn.) Asch. & Graebn. Allium sphaerocephalon subsp. descendens (L.) K.Richt. 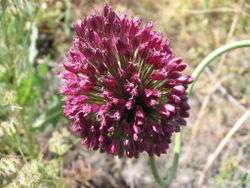 Allium sphaerocephalon is found in the wild across all parts of Europe except in the northernmost countries (Ireland, Netherlands, Scandinavia, and the Baltic States). Its native range extends to northern Africa and to western Asia as far east as Iran. It is also reportedly naturalised in New York State in the US. In the UK it only grows wild in the Avon Gorge so is known locally as the Bristol onion. The species is prized by gardeners because of its striking floral display. The spherical "head" (technically an umbel) is borne on a long scape, up to 50 cm in height, usually in July. It can contain hundreds of deep purple flowers. Allium sphaerocephalon produces egg-shaped bulbs. Small bulblets are present under the outer layer of the stem (making the plant potentially invasive when grown in gardens). Flowers are borne on a scape up to 50 cm in height, in a spherical to egg-shaped umbel, 1–6 cm in diameter, tightly packed with many flowers crowded together. The relatively small size of the umbel relative to the height of the stem makes this one of those described as 'drumstick alliums'. Individual flowers are reddish-purple and are occasionally replaced by bulbils (again making this a potentially invasive species). ↑ "Bristol Onion". Bristol University. Retrieved 2014-10-08. Wikimedia Commons has media related to Allium sphaerocephalon.